I’m sure your looking at this picture and thinking why on earth so much kit? Just have a look at my reasoning and this kit does change for venue. Personally I am a great believer in wearing a helmet, I believe it sets a good example to the up and coming climbing heroes and to beginners alike. However both when I am bouldering and sport climbing I only wear one when I see the need for it.If I am on a well-known, single pitch UK crag I may choose not to wear a helmet, the rest of the time I always wear one if abroad, and especially if I am on multipitch climbs. This is a must! The quickdraws you choose to take should be hard wearing, I use the biggest and thickest ones I can find, after all they are going to spend lots of time being clipped in and out of metal hangers, lots of airtime is likely and I prefer to look down on the biggest equipment possible. Peoples opinions vary but I use the same harness for trad as I do for my sport, I particularly try to avoid the single pitch meat wagon type climbing so prefer longer routes out of the way, and so because of this I need more gear loops, will tend to spend longer periods of time in my harness and carry more equipment. These are or setting up my belays on multipitch climbs, looking after myself at the top of climbs and for abseils. If I do decide to head a little more out of the way and do those exciting multipitch climbs, I will need equipment for the belays, abseils down and taking care of myself and partner. Often when with a single rope and your friend is working that long pitch but struggling, a Gri gri can be very useful and can save the hands a little stress. When I’m off on the multipitch climb, it’s very possible that I will be taking two ropes for an abseil retreat, for this I will take my belay, I always take my belay device if it is anything other tha a single pitch climb. 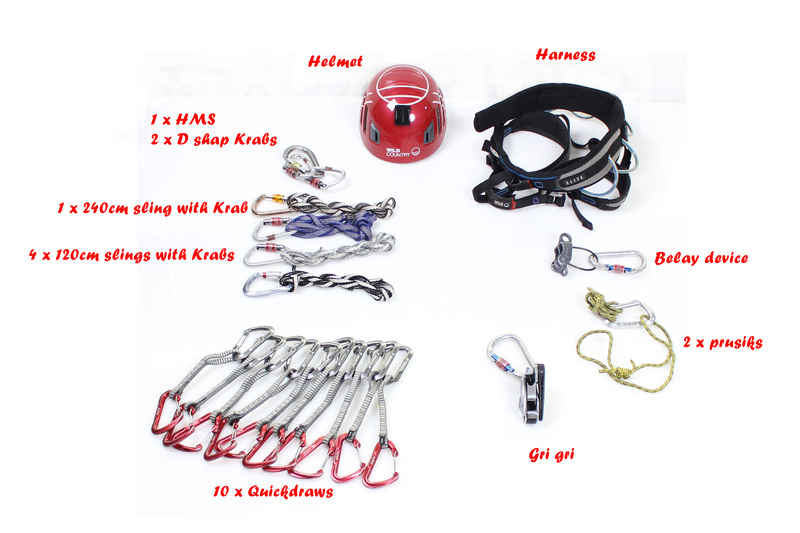 When abseiling these will come in very useful, also if with a partner that is struggling at the top of that 8 pitch route when its getting dark, rather than abseiling 8 pitches why not give them a helping hand with a stirrup hoist?